I’ve shared a few different posts showing how to make Dish Detergent Powder and two different recipes for making your own Dish Tablets HERE and HERE. 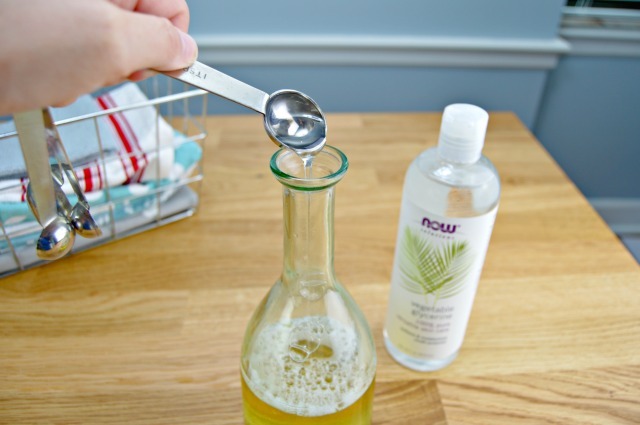 Well, today I want to share my new favorite…Homemade Liquid Dish Soap. This amazing dish soap will cut through grease and leave your dishes sparkling clean. It also makes a great hand soap. This dish soap doesn’t contain a bunch of chemicals that you can’t pronounce either…just a couple of naturally based ingredients. This post contains affiliate links. If you purchase any of the products, I will receive a small commission. 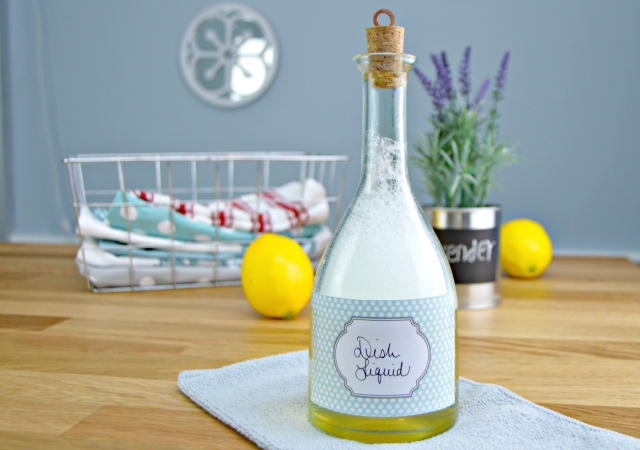 You can make it scent free or add essential oils to give this dish liquid a beautiful scent. 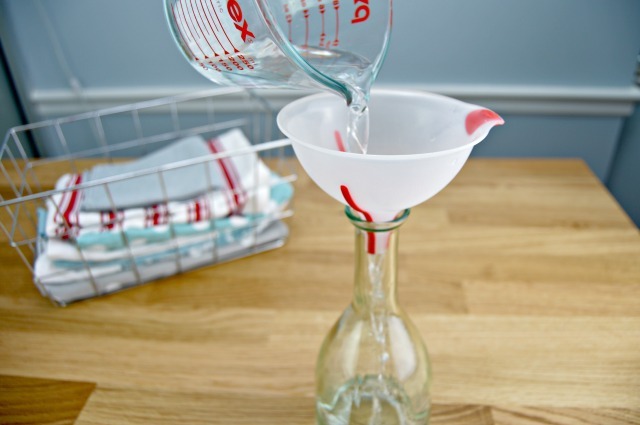 So, come on…let me show you how easy it is to make your own dish liquid! Container to store your dish liquid. Grab your container and a bottle. Add 1/4 cup of water. Next, add 1 cup of Castile Soap. Now add 2 teaspoons of Vegetable Glycerin. If you’d like for you dish soap to be scented, add 10 drops of essential oils. I like lemon and lavender, so I add 5 drops of each. 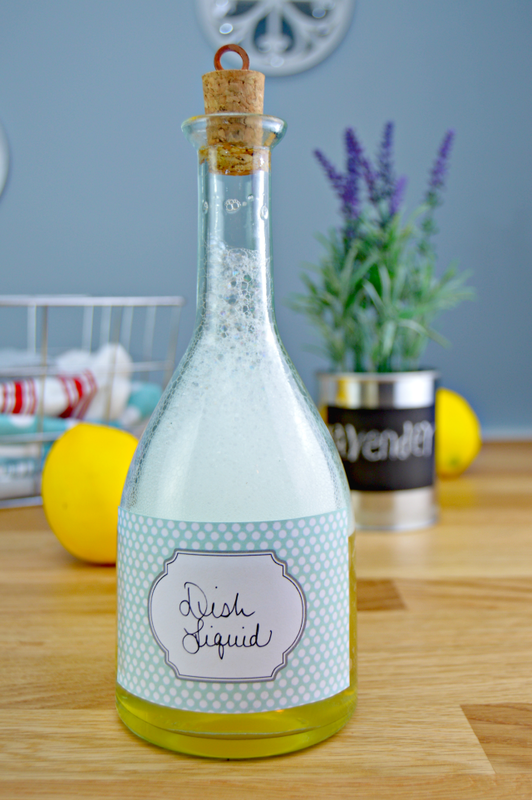 Shake well and your homemade liquid dish soap is ready to use! Grab my Free Printable Cleaning Labels HERE! 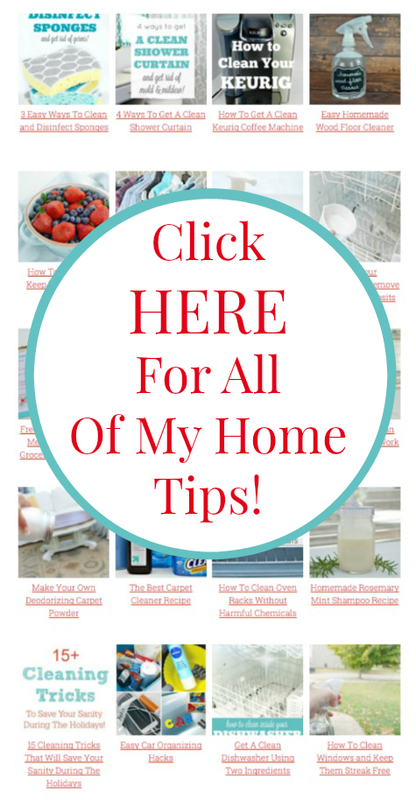 Find all of my Home Tips and Cleaning Recipes HERE! Where do you buy vegetable glycerine Jessica?? Hi Jessica, how long will these homemade products last? Hi, Katie! I usually keep them for up to 3 months. Hope this helps! Where do you buy vegetable glycerin and castile soap – as I would like to make this. Thank you. what exactly does the Glycerin do in this recipe? Is it necessary for the cleaning effect? 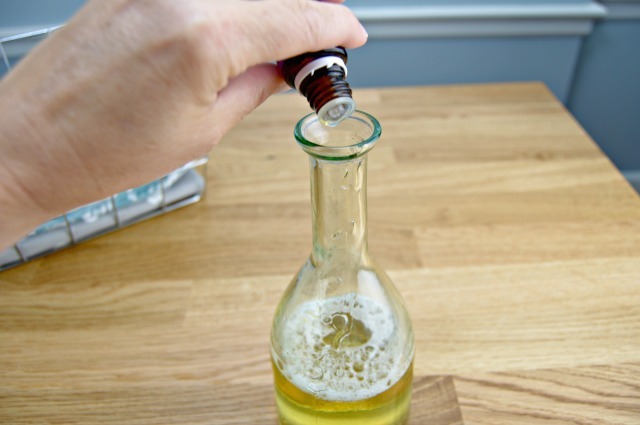 Are there other things I can make with the vegetable glycerin? I have this bottle now, but only one use for it. Any other ideas? Hi Jessica, I receive your emails and use a lot of your recipes for home cleaners. I have been trying to get your dish liquid recipe and have encountered some kind of bug attached to the page. It keeps sending me to the App Store and tells me I have one a free app. I have never had this kind of problem before. I’m using my phone. Just wanted to let you know so you might be able to fix on your end. This may seem like an odd question, but because there is water in this dish soap does that mean that it can “go bad” at some point? Or does the glycerin “preserve” the mixture? Does this end up being cheaper than store bought? TIA! 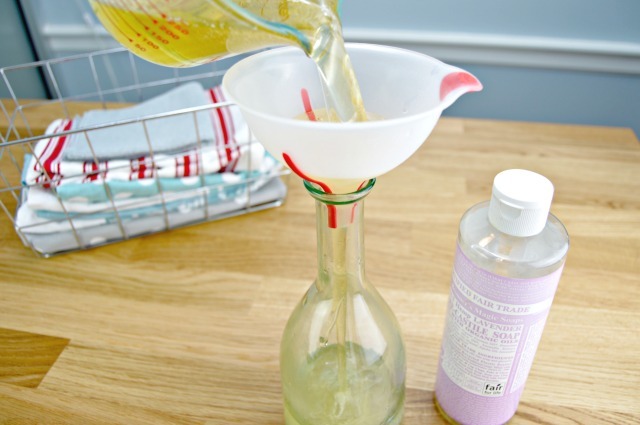 This sounds easy and straightforward but is making your own dish soap at home cost effective? Given that a 32oz bottle of castile soap is often 16$ (price I fought at Walmart.com) which results in 4 cups that allows us to make your recipe only 4 times, that means each dish soap mixture will cost at least 4$. Then we need to add all the other ingredients such as essential oils. 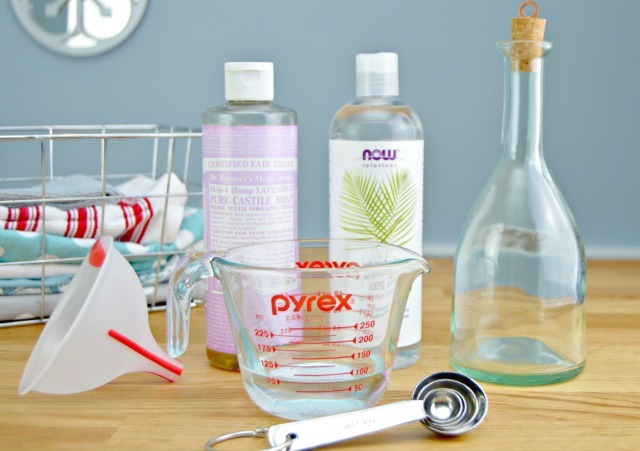 Do you find the homemade dish soap longer lasting than store bought Dawn for instance?